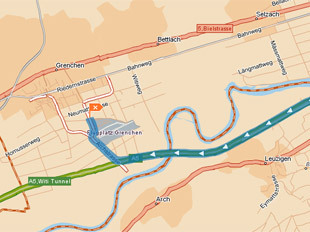 Grenchen Airport is situated between Solothurn and Biel, directly at the Grenchen motorway junction. 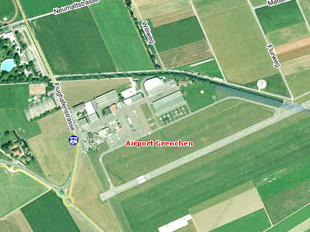 The exact address is: Grenchen Airport, Flughafenstrasse 117, 2540 Grenchen. Use the current online timetable for SBB. For restaurant and hotel guests. Located in front of the restaurant (no. 1 - 41). Parking charges can be deducted from meals had in the restaurant on the same day. The parking ticket serves as identification. For Airport visitors. Located in front and alongside the Airport building (no. 201 - 241, incl. 3 free-of-charge short stay drop-off and loading spaces). For Airport users (pilots, flying instructors, parachutists, passengers, flyers of model planes). Located to the north of the hangars. Spaces are not numbered. Display the ticket clearly on the windscreen. The meadow may be used in good weather and when the ground conditions are good (also subject to parking charges).